My little boy turns 1 year old tomorrow. The time has went by so quickly! 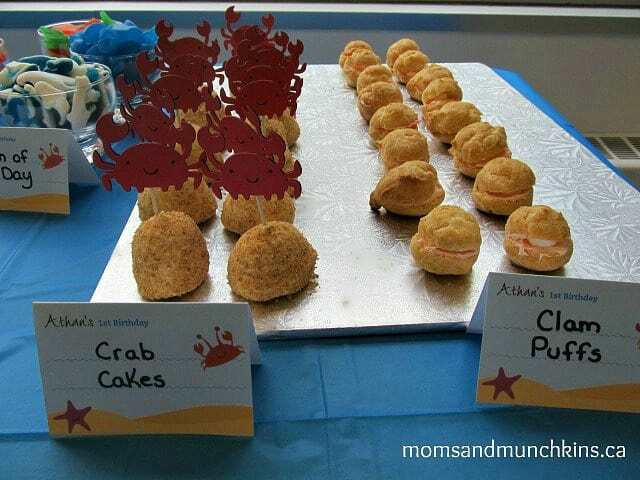 We held his 1st birthday party today at a local pool and did an Under the Sea theme. 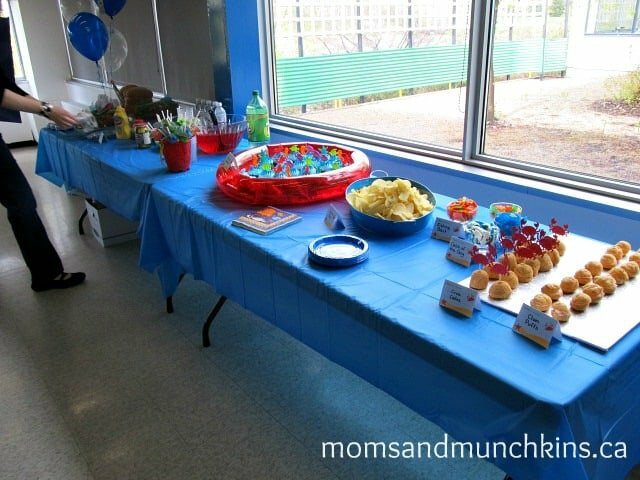 We invited all of the kids & parents to go swimming and then join us in the party room for food & cupcakes. It was a lot of fun! Here are some photos from the party! I ordered this sign and the food place cards from Chickabug. One thing that makes these decorations so great (other than their pure cuteness) is that she emails these to you to print at home! She has so many great party ideas on her site for all types of themes. I’d highly recommend popping by her site to check it out! Our yummy food table above. The table linens were just the easy plastic ones from the dollar store. They are easy to set out and it’s great to be able just to scoop them & the crumbs up at the end of the party and toss them into the trash. The utensil holders above were candle holders from Michael’s craft store and I used a plastic toy boat to hold the sub buns. 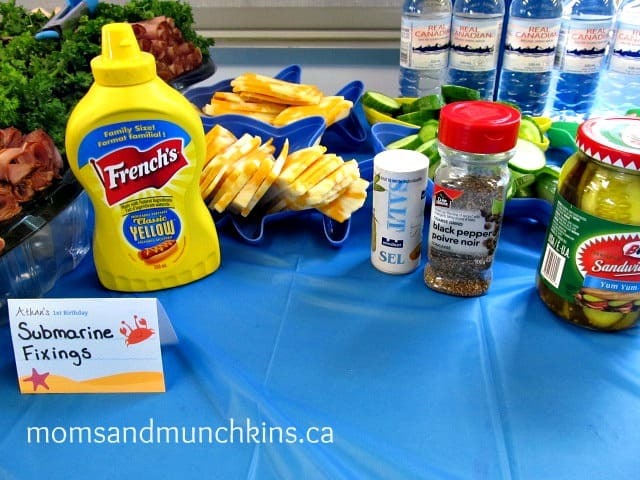 Submarine sandwiches seemed like a good choice of food for the Under The Sea theme. The cheese, vegetables and other submarine fixings were held in shark shaped sand molds flipped upside down. We served punch (Kool-Aid mixed with 7-Up) to drink. A friend found me this super cute fish straws which I placed in a sand bucket beside the punch. 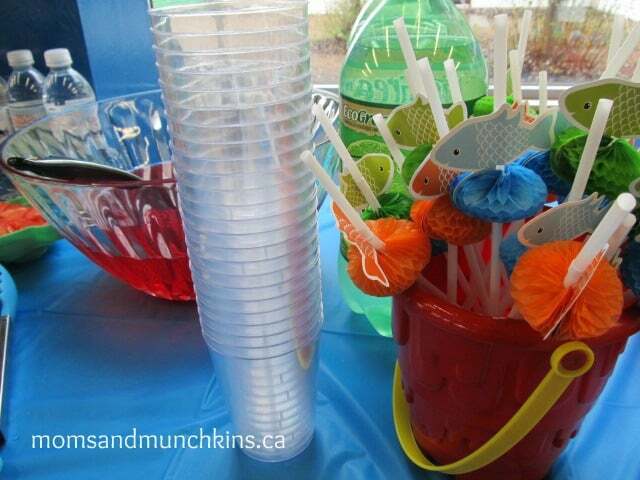 The straws are made by Party Partners. The fish & chip snacks were served in a blue metal serving tray. 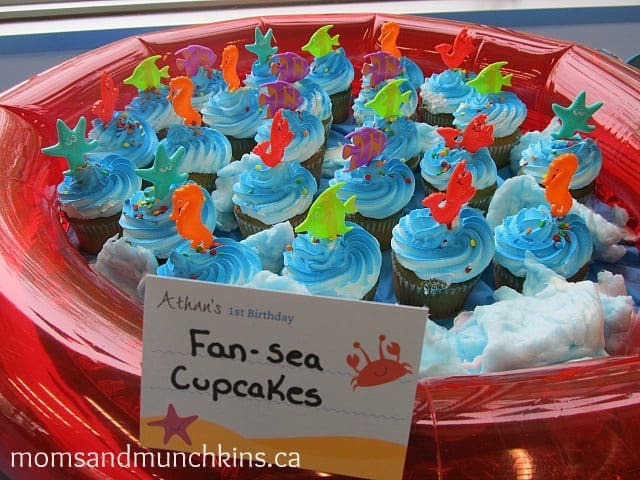 We served blue cupcakes with cute sea-themed cupcake picks. I can’t remember where we purchased these from but here are some cute ones on Amazon.com: Beach Seashore Cupcake Picks – 12ct . I served the cupcakes in a small inflatable pool that we purchased at our local dollar store. I then placed blue cotton candy around the cupcakes to make it look like waves. 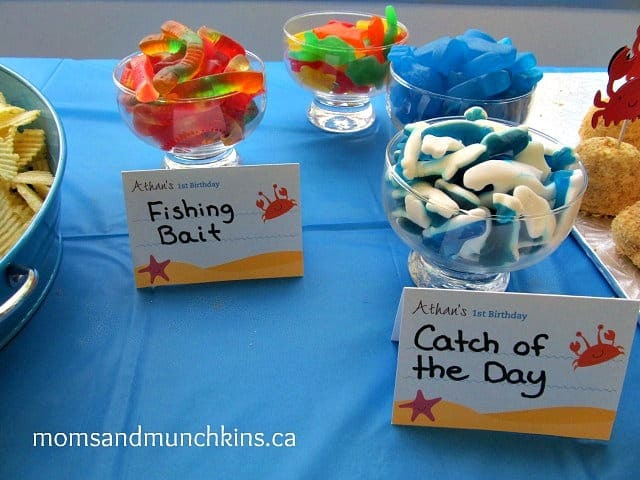 We placed gummie worms on the dessert table labeled “Fishing Bait” along with gummie fish, sharks and whales labeled as “Catch of the Day”. I ordered these super cute crab cupcake picks from The Birthday House. She has so many cute & unique designs for parties! I used the crab cupcake picks in marshmallows rolled in toasted coconut. I also made cream puffs filled with pink icing and a single small marshmallow (as the pearl) for the clam puffs. We purchased this shark cutout from Shindigz. We had guests pose in the shark’s mouth for pictures – an excellent addition to the thank you cards we’ll soon be sending! 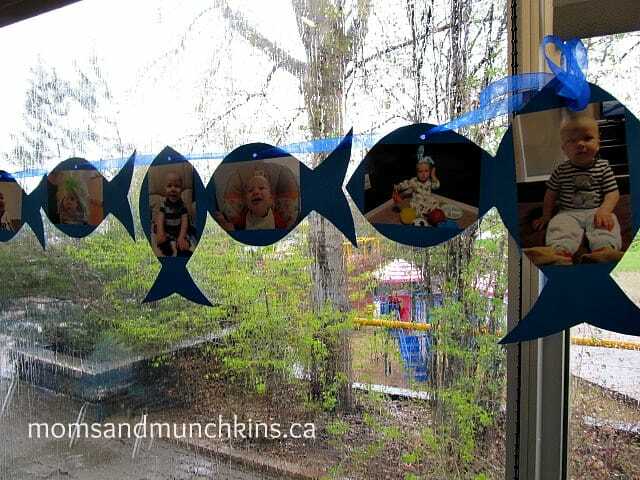 I created a first year banner using one picture from each month of my son’s first year. 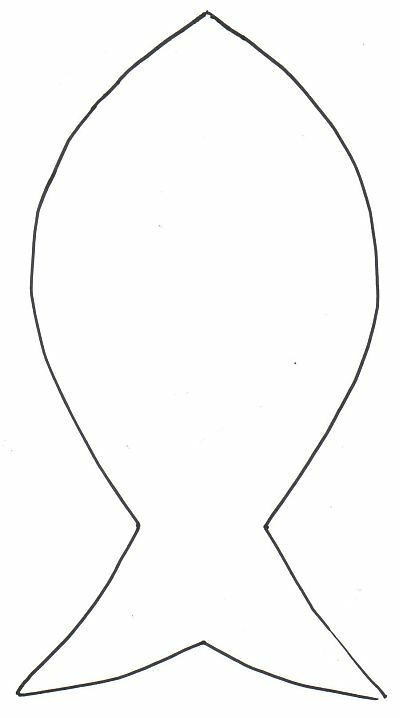 I used this free fish template and printed them on blue cardstock paper. I then used ribbon to loop through each of the photo cards to create the banner. It’s so cute to see how much the little ones change throughout the months – especially in the first year! 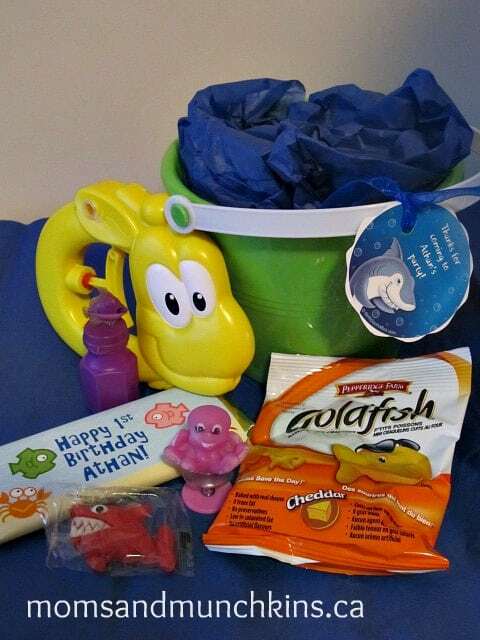 For treat bags I filled a sand bucket for each guest with a few goodies, a small water toy, Shark Gummy Candy, goldfish crackers, a personalized chocolate bar (from Whimsy Wraps), a small ocean-themed toy and a Tropical Fish Bubble Bottle . I covered the treats with blue tissue paper and tied a personalized shark sticker to the handle. We had a great time & we look forward to more celebrating tomorrow with family! 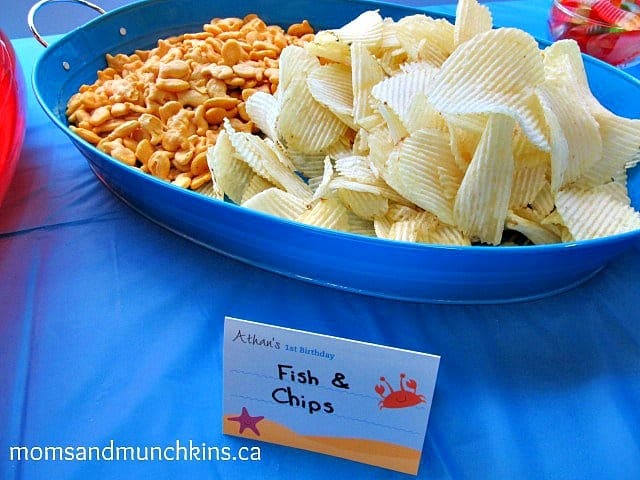 For more Under The Sea party ideas, click here. We’re always adding new party ideas! Check us out on on Facebook, Twitter, Pinterest and Bloglovin’ and follow along for the latest ideas. *Disclosure: I am part of the Big Dot of Happiness, Amazon.com and Birthday in a Box affiliate programs. Any reviews in this post are of my own opinion and experience. 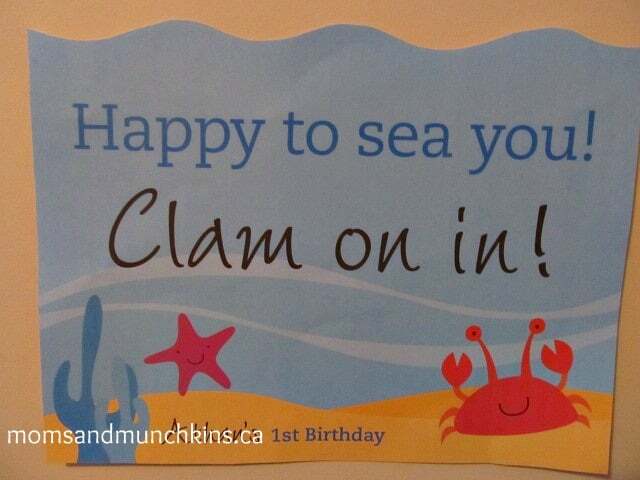 I like your Under The Sea birthday idea. Beach Seashore Cupcake, Shark Gummy Candy, goldfish crackers are the best parts of this party. I think so that you might be interested in new,creative ideas please check out MyBirthdaySupplies.com for more details. Those decorations are gorgeous! I loved the “fish & chips”, too. It looks like the party was a great time. Stopping by from the SITS Spring Fling! Thanks! I’m glad you stopped by – on my way to see you now! Thank you so much for the kind words and thanks for stopping by! Thank you so much for stopping by – on my way to see you now! The under the sea party is so cute! I love those ideas. Hello from SITS and I am now following. Thank you so much for the great decorations! Unfortunately I didn’t get a good picture of the banner but it turned out great too. Thanks! What a “Seasational” celebration! You thought of everything, Cheryl. 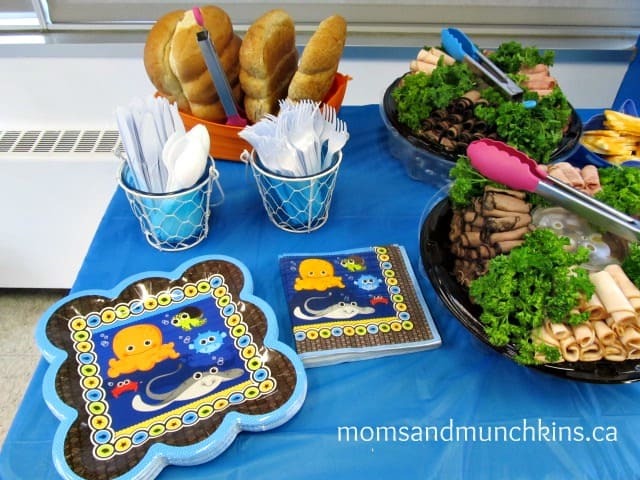 Many of the ideas are perfect for birthday parties and baby showers! Fun! Fun! Fun! and Yum! Yum! Yum! What a memory making celebration for everyone! Thank you so much for linking up at Whip it up Wednesday. This is so stinkin’ cute! Those are a lot of cute ideas! Did you think of all that stuff yourself? So many fun party ideas! I’d love for you to add it on my link party at: http://printabelle.com/?p=3717 Thanks!